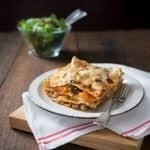 You don’t have to be a vegetarian to love this Thermomix Vegetable Lasagne. Packed full of delicious veggies, it makes a comforting mid week meal or a delicious winter bake to have by the fire with friends. Special thanks to Thermomix for this delicious Vegetable Lasagne recipe from the Vegetarian Kitchen cookbook. As Lasagnes go, it’s wholesome, nourishing and easy to make. The Vegetarian Kitchen cookbook has over 80 plant based recipes for breakfasts, light meals, dinners and desserts. Even if you’re not vegetarian there are many nutritionally balanced recipes to choose from such as Stuffed Portobello Mushrooms, Chilli Chutney Quesadillas and Orange and Passion Fruit Eton Mess for dessert. I love to serve this Thermomix Vegetable Lasagne with garlic bread and a fresh garden salad but it tastes equally nice just on it’s own. If you’re after some more Thermomix pasta recipes – check out my Thermomix Macaroni Cheese with Crispy Pancetta and Thermomix Gluten Free Spinach and Lemon Pasta. 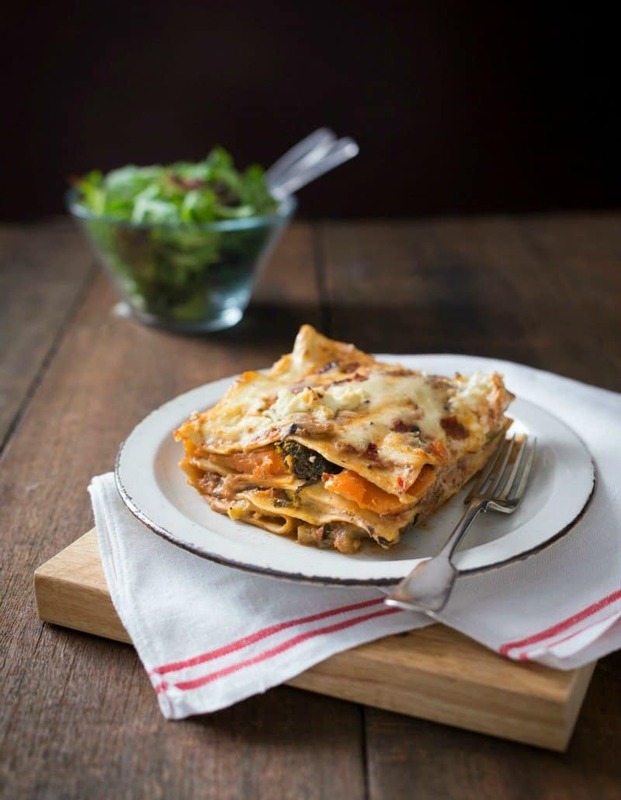 A deliciously packed Thermomix Vegetable Lasagne which tastes just as good as the meat version. For the lemon and ricotta, place lemon zest and garlic into mixing bowl and grate 20 sec/speed 7. Scrape down sides of mixing bowl with spatula. Add lemon juice and ricotta and mix 10 sec/speed 3. Transfer into a bowl and set aside. For the béchamel sauce, without cleaning mixing bowl, place all béchamel sauce ingredients into mixing bowl and cook 7 min/90°C/speed 4. Transfer into a jug, cover and set aside. Clean and dry mixing bowl. For the Sauce and vegetable filling, place Parmesan cheese into mixing bowl and grate 10 sec/speed 10. Transfer into a bowl and set aside. Clean and dry mixing bowl. Place onion, garlic and chilli into mixing bowl and chop 3 sec/speed 7. Scrape down sides of mixing bowl with spatula. Add oil and cook 3 min/100°C/speed 1. Add tomatoes, wine, basil, parsley, oregano, salt and pepper. Place Varoma dish into position and weigh sweet potato and eggplant into it. Insert Varoma tray and weigh zucchini and mushrooms onto it. Secure Varoma lid and steam 15 min/Varoma/speed 1. Set Varoma aside. Add kale (optional) into mixing bowl, place Varoma back into position, secure Varoma lid and cook 2 min/Varoma/speed 2. Preheat oven to 180°C. Lightly grease a casserole dish (40 × 25 × 6 cm). For assembly, cover base of casserole dish with a thin layer of tomato sauce (approx. 3-4 tablespoons). 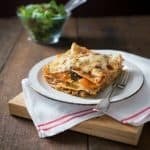 Place a layer of lasagne sheets over sauce, cover with all of the eggplant, one-third of the reserved béchamel sauce and one-third of the tomato sauce. Cover sauce with another layer of lasagne sheets. Top with all of the zucchini, one-third of the tomato sauce and half of the lemon ricotta. Cover ricotta with another layer of lasagne sheets. Top with all of the sweet potato and one-third of the béchamel sauce. Cover béchamel with another layer of lasagne sheets. Top with all of the mushrooms and remaining béchamel sauce. Cover with remaining lasagne sheets and remaining tomato sauce. Top with remaining lemon ricotta, then sprinkle with reserved Parmesan cheese. Bake for 35 minutes (180°C), or until cheese is golden. Serve immediately with garlic bread and a fresh green salad.